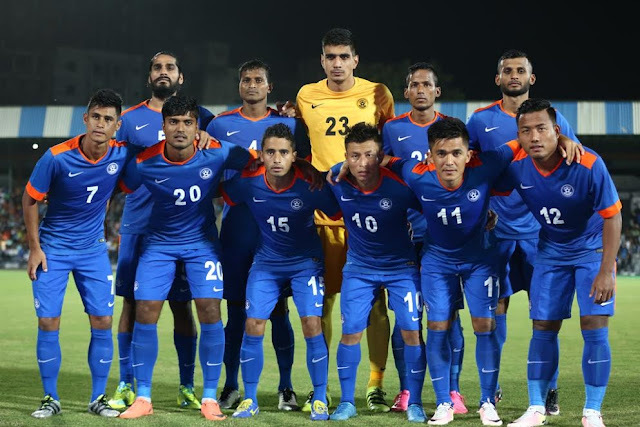 Indian National Team jumped 31 places to be ranked at 101 - their best ever ranking since 1993, after FIFA released their latest ranking charts earlier today, 6th April 2017. 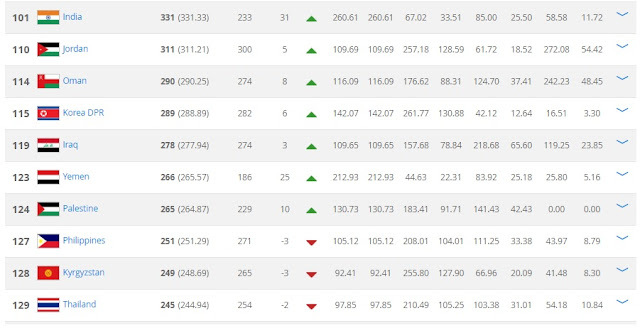 Team India are placed at 11th spot in the AFC rankings. Previously ranked 132nd, Blue Tigers took the big jump courtesy of their recent twin triumph - first defeating Cambodia 3-2 in the International Friendly followed by a 1-0 win over Myanmar in the AFC Asia Cup Qualifiers. 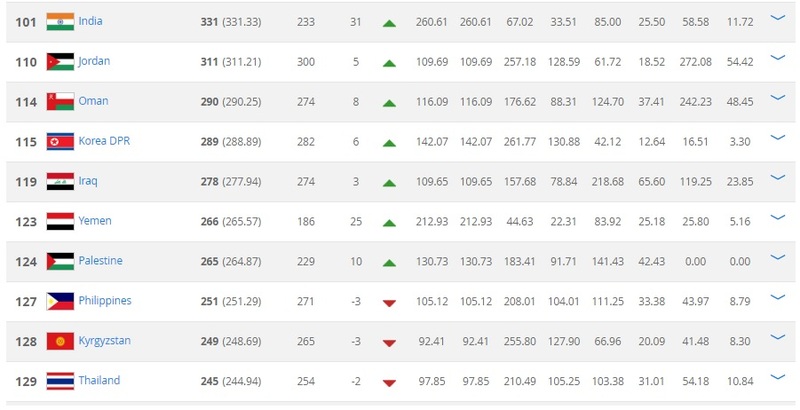 This is undoubtedly a big step for Indian Football to achieve such ranking but the major challenge will be to sustain the place which would be really tough. 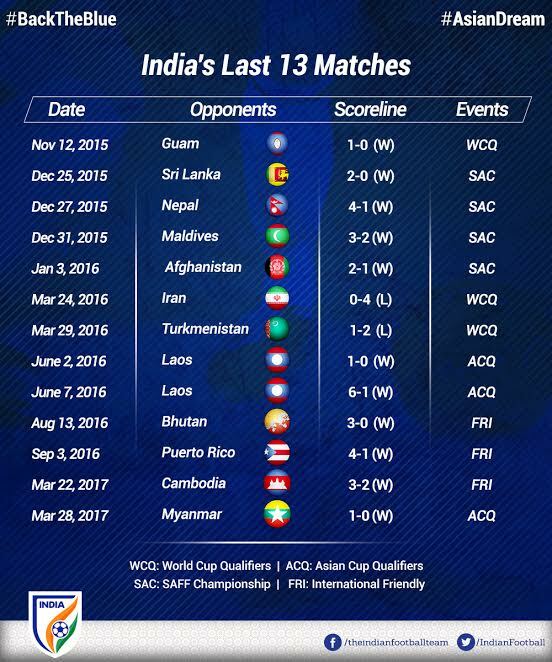 Considering that teams like Korea DPR, Oman, Jordan, Iraq and Thailand are ranked below us makes one realize how tough it is for the Blue Tigers to keep their place. Nevertheless, Stephen Constantine deserves huge credit for bringing in a breath of fresh air within the team handing debuts to several players and thus increasing the national pool. Recent performances have been the key and one would hope that the same continues. 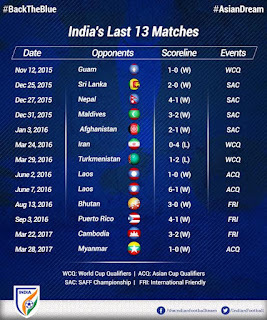 India's next International fixture is against Lebanon on 7th June 2017 followed by Kyrgyz Republic at home on 13th June 2017 in their next AFC Asian Cup qualifier tie.